The yellow curry paste is one of our favorite curry pastes. It is less spicy than the red curry paste and it fits well to many typical Thai dishes with our without meat. When you are used to the packed pastes from the supermarket you should try to make your own paste one day. You will taste the difference. 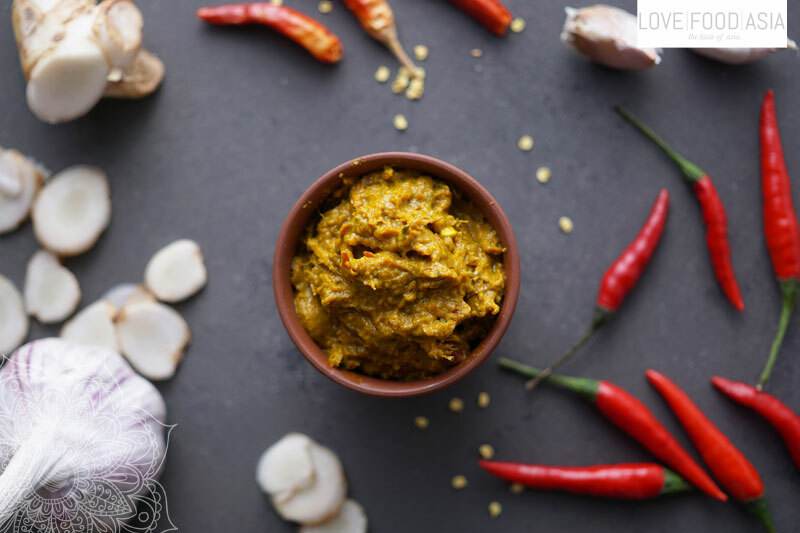 In this simple recipe we show you how to make your own authentic Thai yellow curry paste in just a few steps. Preheat oven to 180°C. Peel shallots – drizzle with oil and wrap in alu foil. Peel ginger and cut into thin slices. Arrange in a single layer, drizzle with oil, and wrap in foil. Pull the outer paper off the garlic. Cut the pointy tops off the heads of garlic so the cloves are partially exposed. Drizzle with oil, and wrap each head of garlic in foil. Place all packets on a baking sheet and bake for 15 minutes. Remove ginger (it should be soft), increase the temperature to 200°C, and roast shallots and garlic for another 30 minutes until golden brown and very fragrant. While the aromatics are roasting, pour boiling water over chili peppers to rehydrate them. Let them soak for 15 minutes. Drain water. Put everything in a food processor or in a very strong blender. Pulse or puree until the yellow curry paste reaches your desired consistency. The paste keeps for about a week in the fridge and it freezes well!